The lady who took mostly care of us (she welcomed us on arrival, took care of us at breakfast, gave us useful tips, etc) was very nice, although she spoke only Spanish. We saw the owner mostly at night, at dinner. Nice and clean but no more than that. Muy cuidado hasta el último detalle, sin duda un lugar muy especial, el personal es muy amable y atento. Sin duda repetiré. Para todos los que quieran saber si es recomendable os digo por mi experiencia que es 100% me lo pase estupendamente y no hay mejor servicio que el de ellos, volveré sin pensarlo, es un sitio muy tranquilo y con mucho encanto idílico para pasar un fin de semana romántico en pareja y desconectar. el desayuno es muy bueno, la relación calidad precio es muy interesante. 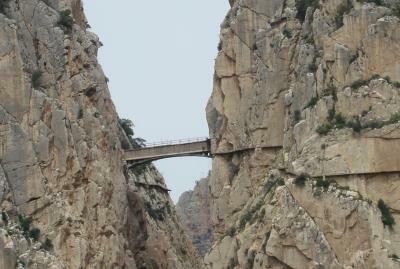 La tranquilidad del sitio. La decoración de la posada en general y de nuestra habitación, todo con un lujo de detalles. Las cenas exquisitas. Posada Los Cantaros This rating is a reflection of how the property compares to the industry standard when it comes to price, facilities and services available. It's based on a self-evaluation by the property. Use this rating to help choose your stay! Set in a 19th-century country house, Posada Los Cantaros has an outdoor pool and gardens. The air-conditioned rooms include free Wi-Fi and a TV with DVD player. 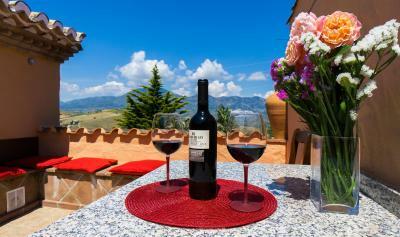 Posada Los Cántaros offers superb views of Andalusia’s Sierra de las Nieves Mountains. 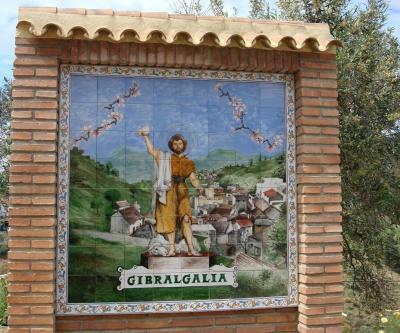 It is less than 25 mi from Málaga and the beaches of the Costa del Sol. 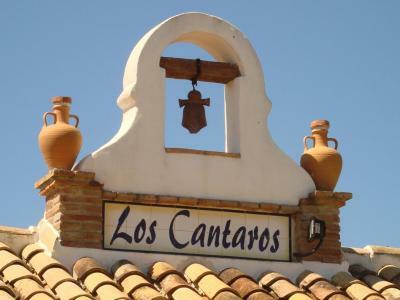 Los Cántaros has a characteristic restaurant with wonderful mountain views. 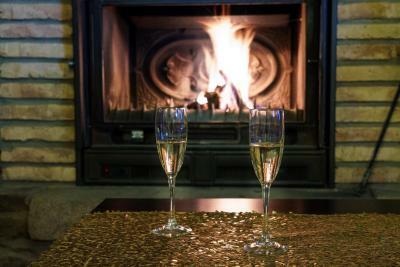 There is also a comfortable lounge with an open fireplace. Free private parking is available at the Posada. 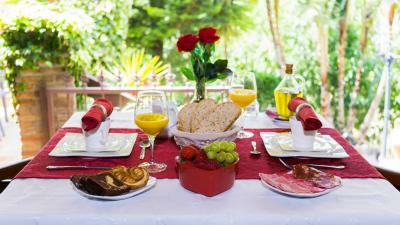 The reception can arrange car or bicycle rental and provide information about the area. When would you like to stay at Posada Los Cantaros? This charming room features rustic décor with wooden furniture, Egyptian cotton sheets and goose-feather duvets. It comes with a sloping ceiling and parquet floors. The private bathroom includes a shower with chromotherapy. The room offers views over the countryside. This spacious room includes a large spa bath and a private terrace with views of the valley and the surrounding mountains. This room includes a spa bath and a 49 ft² private terrace with views of the valley and the surrounding mountains. This spacious room includes a large spa bath and a floor-to-ceiling window with views of the valley and the surrounding mountains.. This suite has a bathrobe, mini-bar and DVD player. House Rules Posada Los Cantaros takes special requests – add in the next step! Posada Los Cantaros accepts these cards and reserves the right to temporarily hold an amount prior to arrival. We were charged 10% Vat on top of the price agreed with booking.com on arrival. The room was pretty but very cold. We turned on the aircon/heating unit at once. Warm air came out of it but not enough power to heat the room as after an hour we were still wearing jumpers and coats. There was a puddle of red liquid on the floor which seemed to come from a white box - maybe to do with pests as there was a centipede in the bath. No bath plug either. The room service menu was from 1pm to 9pm but the cook was not due to arrive until 8pm. The owner didn't think they had many ingredients as it was low season but thought we could probably have a salad. There was one chair and a tiny table so I am not sure where we should eat the food from room service. Eating in the dining room was only for a 3 course dinner and we wanted something lighter. We went downstairs in the hope of sitting by the fire but it was not lit (at 8pm) so gave up and drove home. Probably used to be a great place but really needs an update. Really old school. Owner does not like critisism even if it is positively meant, he always has his answer ready. Breakfast and evening Dinner was excellent .